Toxic Staple | How GLUTEN may be wrecking your health – and what you can do about it! Toxic Staple exposes how the devastating effects of gluten reach far beyond celiac disease. Over 300 symptoms and maladies are linked to this insidious protein, from allergies, arthritis, asthma, autoimmune disease, cancer, depression, fatigue, gut or memory issues, migraines, osteoporosis, reflux… to zits. 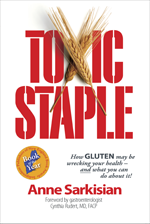 Toxic Staple: How Gluten May Be Wrecking Your Health and What You Can Do about It! has been named the recipient of four awards presented by the Independent Publishers of New England (IPNE) for 2014: Book of the Year, Informational Non-Fiction, Cover Design, and Interior Design. The book was also a finalist in the category of Promotion. IPNE is a nonprofit trade association offering opportunities for education, networking, and marketing to small indie publishers.